Christmas is coming and the Micro Dark has every chance of being a runaway success. If you want one on your list, then we urge you to act now! Big sound from a tiny amp. Good price. Almost a decade ago, Orange scored a major worldwide hit with the release of the Tiny Terror, with over 30,000 sold and many more if you add in the subsequent designs. Beyond any doubt, the Tiny Terror was a major boost to small 'lunchbox' amp popularity, and today practically every manufacturer has one in its catalogue. Now there's a new product from the legendary British manufacturer that threatens to do it all over again and create a new cult for even smaller amps: the Micro Dark head. It may look like a toy, but the Micro Dark is every inch a real amplifier, with a very usable 20-watt solid-state power stage coupled to a preamp that uses a single 12AX7 for authentic valve-overdrive timbres. It has the same heavy-duty enamelled steel chassis and cover of its bigger cousins and is built to last, with all the internal components mounted on one very high-quality PCB. One of the reasons the Micro Dark is so small is that it relies on an external power supply: a laptop-style brick providing 15 volts. This aside, everything else is where you'd expect to find it. The Micro Dark is a straightforward single-channel design with controls for gain and volume, together with Orange's very versatile Shape tone control, which boosts mids in one direction and scoops them in the other. There's also a very usable headphone output that features Orange's authentic CabSim speaker emulation, in addition to a speaker output, and a fully buffered effects loop. Plugged into a Vintage 30-loaded 4x12, the first thing that the Micro Dark impresses us with is its volume - easily one of the biggest-sounding 20-watt heads we've tested in a long time, with an impressive dynamic range not far off a valve output stage. Gain and shape controls work together for a wide range of drive and tone characteristics; you can get quite close to the Class A sparkle of the AD30R, and there's enough space for some mildly driven classic-rock sounds. Turn up the gain to the last third of its travel and the Dark Terror's insane overdrive is unleashed, with more than enough distortion for satisfyingly thick modern rock and metal sounds. 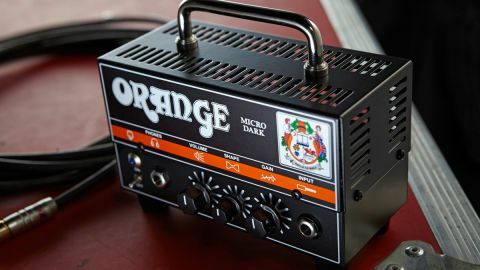 Overall, it's astonishing just how much great tone Orange has managed to squeeze into such a small box - with a 4x12 or 2x12, this amp is plenty loud enough for home practice, rehearsals or even small gigs. Despite the Micro Dark's diminutive appearance, it's capable of tone and volume out of all proportion to its size. At less than the cost of many high-end overdrive pedals, here's a proper amp that's small enough to live in any gigbag, yet powerful enough to handle almost any situation. The price is more than reasonable, and for what this little head can do, it's a steal.